Hot swap up to four 3.5in SATA hard drives in seconds. This 4 Bay SATA Mobile Rack lets you swap between 3.5in Serial ATA (SATA, SATA II, SATA III-6Gbps) hard drives in seconds. 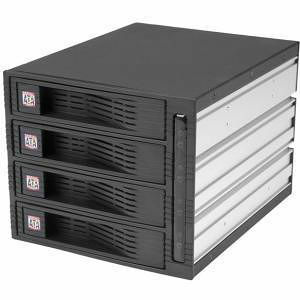 A time saving storage solution, the mobile rack offers four trayless SATA hard drive bays, allowing you to hot swap Serial ATA hard drives but avoid having to mount the drives to trays for deployment or unfasten them for replacement. Supporting up to four hard drives, the mobile SATA hot swap rack only takes up three 5.25in drive bays inside a host computer - maximizing space-efficiency within the computer. The mobile rack/backplane is fully compatible with RAID installations to ensure maximum performance and versatility for enhanced storage applications. Using Terabyte hard drives? Don't expose your Hard Drive and valuable data to unnecessary heat! The HSB430SATBK has two built-in 40mm fans that re-distribute the heat build-up generated as a result of typical drive operation. This feature is especially important for larger volume storage drives, and faster "spinning" drives (i.e 7200 RPM), as it can help optimize drive operability and in turn preserve stored data integrity.